We deliver results for students and instructors in any environment, from PreK–12 through Higher Education and Professional Development. 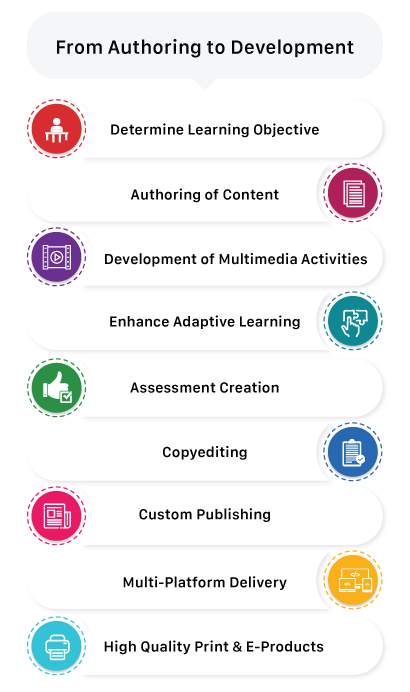 Our experienced teams create engaging and instructionally sound content through content creation and development life cycle. Our talented content team will work with you from beginning to end to deliver exceptional content, on time, on spec, and on budget, in print and digital formats. We keep abreast of educational trends and curriculum standards, and we work with you as content development partners to create, develop, design, and produce content that is well conceived, organized, current, and accurate. We offer a full range of US-based editorial services to ensure content of the highest quality. We also have the unique advantage of providing services through our offshore facilities, when feasible, to achieve the most cost-effective strategy. Our professional staff will work with you to determine your specific project needs and to customize a package that is right for you. From conception to implementation our design and art teams work with you to capture your design philosophy and concept ideas to provide the most appealing visual rendering of your content, and to accurately illustrate the most difficult concepts. With a deep understanding of design principles and product strategy, we work closely with content developers to ensure that the right design hierarchy supports your core texts, supplemental components and user interface. Our rights and permissions experts are skilled in all aspects of research, clearance, and copyright law. We work as an extension of your team, providing personalized service and solutions to achieve project objectives.